There is a room. It is filled with salt. It is the “Salt Room.” Doug Fogelson’s latest exhibition pairs photograms made from salt with 3,000 pounds of rock salt spread on the floor, wall to wall, of a storefront gallery. Fogelson founded and directs Front Forty Press, an art-book publisher based in Chicago, and he often exhibits his own photographic prints and sculptural installations. “Salt Room (Winter on the Moon)” is his first publicly exhibited ground covering. The salted layer of floor here evokes many things: the luminous snow right outside; a moonscape, wasteland or other no man’s land; a crystal palace’s ashes. It is a gravel aquarium for humans to frolic while passersby peer in through the large street-level display windows. The overall effect is crunchy and cold. 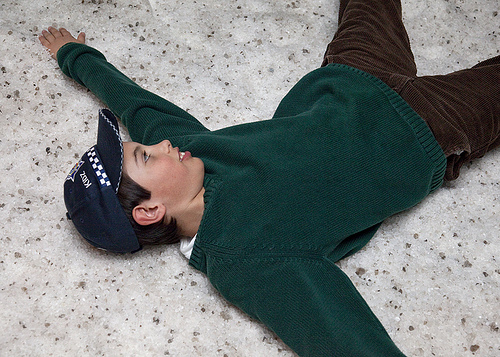 Floor scatterings, stretching from gallery wall to wall, abound in contemporary art history. Not all are passable, such as Walter De Maria’s “New York Earth Room,” several feet deep of potting soil, on continuous view since 1979 in a second floor apartment in SoHo. The dirt is separated from viewer by a transparent retaining wall. There have been rooms filled with rice (Wolfgang Laib, 2007), garbage (Arman, 1960), black balloons (Martin Creed, 2001), bricks (Carl Andre, 1967), cinnamon (Amber Ginsburg in Oak Park, 2008), and Richard Wilson’s “20:50,” which is an oil slick reflecting pool on continuous view inside Saatchi Gallery since 1991. Visitors to Rudolf Stingel’s retrospective (Chicago, 2007) were invited to wipe their street-cruddy shoes on the artist’s fluorescent orange carpet, reducing carpet sculpture to an obvious endgame. ‘Carpet art’ seems an okay term for the genre. Plain and singular materials, like dirt, salt, bricks, rice, etcetera, are placed uncommonly on the whole floor, spread out and repeated in excess, so their uninterrupted pattern suggests a strange structure or platform for something different, unexpected to happen. Creed’s shiny black balloonscape and Wilson’s mirror-like oil spill room look similar to each other. The carpet sculptures are landscapes of little variation. Mostly they just colonize and conquer—coating the landscape with anti-landscape. Sure, they make dramatic visual experiences, but they set the stage, so to speak, for one thing to take place—itself. Like monochromatic paintings, carpet sculptures are immersive and quieting. They suggest the possibility for a single thing to command power, even if to absurd lengths. “Salt Room” benefits from being interactive, and in turn, viewers might benefit as well. Salt rooms, or salt caves, are homeopathic therapy centers, popularized in the last two centuries, and “Dead Sea” is a favorite branding phrase on age-reduction creams. So, salt is good for you. Or, it’s bad. Sodium over-consumption ups the rates of obesity and heart disease. But iodized salt prevents brain and gland deformation in infants, so salt is pretty good, and it tastes good (but I didn’t need to taste the Home Depot rock salt dumped at “Salt Room”). “One thing I’d ask is for you to just sit on the floor for a while and touch the salt,” requested Fogelson, like a salt-healer guru. Sitting there was easy enough, with two wide window sills covered by the odorless rock salt. I attended the room alone, which I can imagine is a very different experience than having attended the opening celebration, or attending the upcoming closing party. Alone, you can take it all in as a whole, as an inverted landscape, and pristine, not with tens of feet crushing it. Or you can just walk by, on your way home, and glance inside at its pocked nothingness.